This year's OPSEU Convention was held April 6 - 9 at the Metro Toronto Convention Centre. This annual event was also a significant milestone as it celebrated the 100th year anniversary of the OPSEU organization. 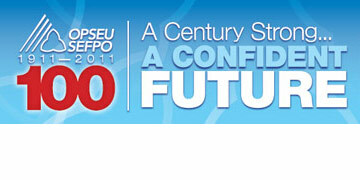 "A Century Strong....A Confident Future, OPSEU/SEFPO 1911-2011". This CD format video is available on loan from the Local 331 office. Our local sent 5 delegates, 5 alternates, and 1 observer to Toronto. In addition to the regular work of constitutions, budgets, and resolutions, a big item on the agenda was the election of the Union President. 908 ballots were cast this morning and 621 of them strongly returned Warren 'Smokey' Thomas to his third term. Smokey and newly elected Vice President Eduardo (Eddy) Almeida who replaces outgoing V.P. Patty Rout, will continue "to work for the kind of Ontario that workers want, a good jobs economy where public sector programs are not sacrificed to satisfy corporate greed." 2nd Vice President Nancy Pridham, 3rd V.P. Jamie Tocker, 4th V.P. Gino Franche, 5th V.P. Dave Lundy, 6th V.P. Pete Wright, 7th V.P. Mike Grimaldi, 8th V.P. Sue Brown.